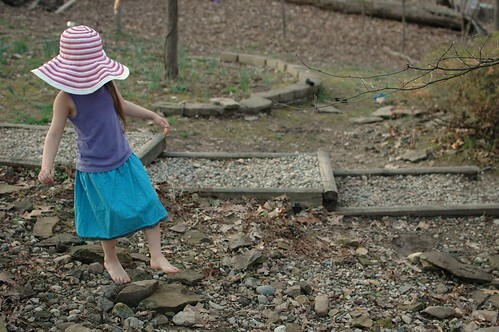 Easy Baby Skirt- With Attached Bloomers! Here's the second skirt pattern, as promised! 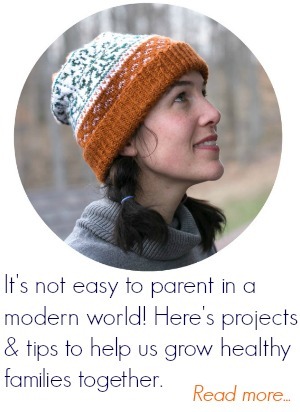 If you missed the first pattern, you can find it here. As I've shared before, we live at least a half an hour from everything. 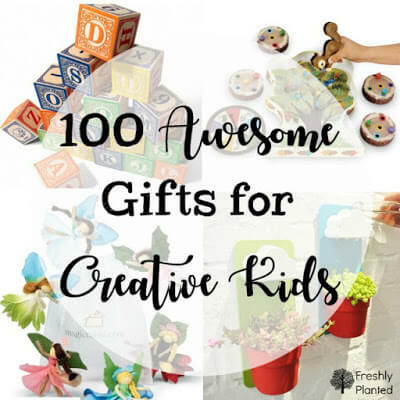 Which can make projects tricky sometimes. For instance, when you're making a onesie dress and forget to buy the plain onesie (ahem). So, after some digging around, I found these bloomers & had an inspiration. Two in one! I love how these layers stay together when Esther is wearing them. Simple for dressing, and diaper changes too. Step 1: Measure & cut your rectangle. For this 3/6 month skirt, I cut my rectangle 30 inches wide by 9 1/2 inches long**. This skirt hits right at her chubby little knees, which gives her length to grow- very important! 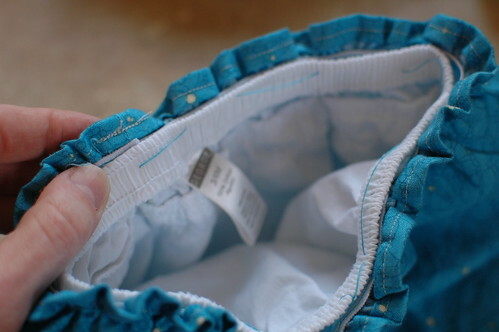 **If you have bloomers for a larger size, you can easily add to the width. Measure the top of your bloomers, then multiply that number by 4. For a longer skirt, just add to the length as desired. I reference this chart when deciding on waist size & skirt length for girls 6 months-15 years. Step 2: Sew the back seam together, making a long skirt tube. My seam allowance was 1/2 inch, but you can use whichever allowance you like. Press the seam open. Step 3: Hem your skirt. You can sew a standard hem, or a super easy ribbon hem. 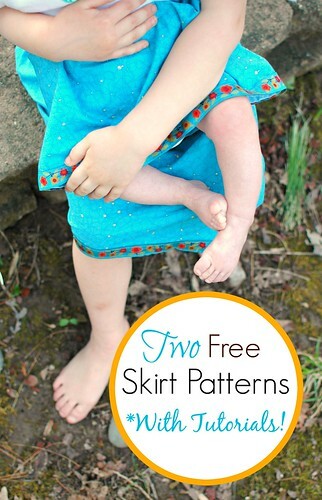 I follow the ribbon hem directions on this free Oliver + S skirt pattern. Step 4: Then attach the elastic to the top of skirt, per step 8 on these instructions via Barefoot in the Kitchen. If you have larger bloomers you'll need a longer elastic too- check out this step to get the proper length measurement. Step 5: This step is optional, but I found it very handy for attaching the skirt to the bloomers. 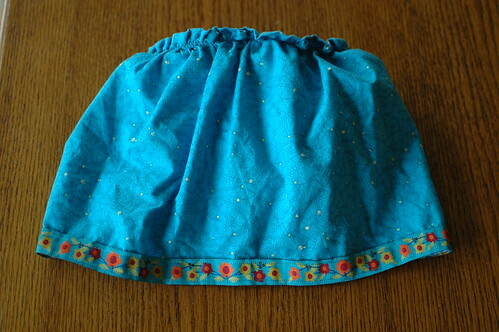 I sewed the skirt to the bloomers using a very loose stitch. Alternately you could pin them together, but I think this took the same amount of time- without shifting on me (or pricking my fingers) as I sewed. Step 6: Sew a small zigzag stitch from the outside with a coordinating thread, right over your elastic gather (from Step 4). 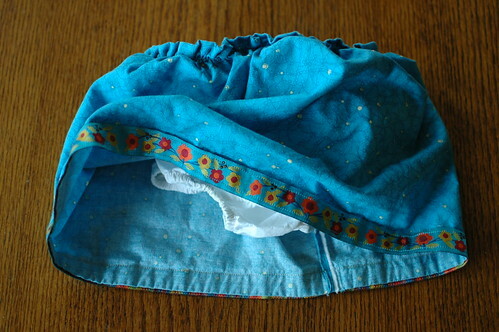 Make sure you're catching your bloomers as you sew, and that you back-stitch at the end. I went back and forth a couple times at the end for strength; Esther is small but mighty! Remove the thread from Step 5, if you used one. Step 7: Admire, enjoy, celebrate! Step 8: Take necessary pictures with big sister, in matching skirts. Can you see those chubby little feet? I'm biased, but I think those might be the most kissable toes ever. But that's just my opinion (wink). 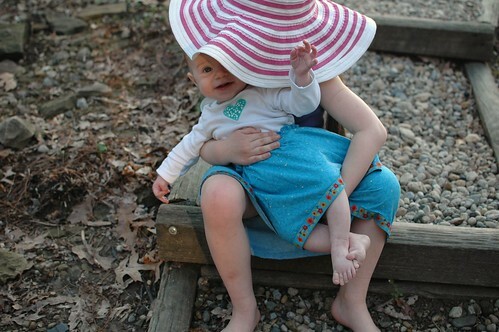 Speaking of big sisters, here are a few more pictures of Isia wearing her matching skirt. 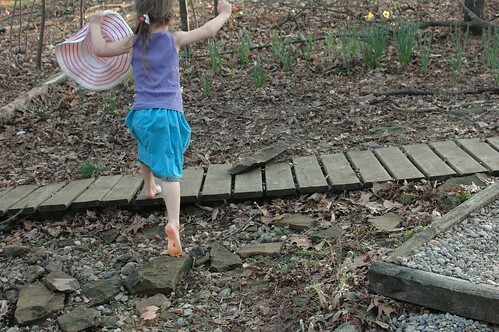 As you can see, it's great for playing in the woods. Which means there's already been a request for "at least one more." It's already been laundered twice, and is holding up great, so I see at least one more in our future. Perfect for adventures!